I have owned several dogs: a Dalmatian that bit friends, a Great Dane that ate a couch and a Shih Tzu that barked at the sky. Today I own a fat Dachshund that is not house broken and an English Springer spaniel with a misspelled name. (Called “Gauge” to reflect his gun-dog heritage, the name morphed to “Gage” after a nurse’s spelling error on paperwork at the animal hospital. Yes, he frequents the animal hospital.) The error carried over to Christmas cards and the dog collar. I cannot look at Gage or say his name without noting the misspelling. The other flaw I have trouble living with is his passion for running away. Gage requires daily exercise; we run several 5Ks each week . 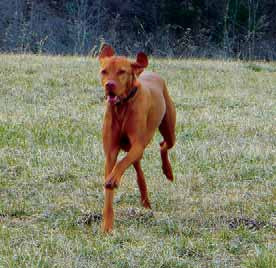 Sometimes we run with my friend Howard “H.K.” Kelly and his Vizsla, Crusoe. Both upland bird dogs were born to hunt and require outdoor activity. Upland terrain is dry and elevated, like the land in central Virginia. 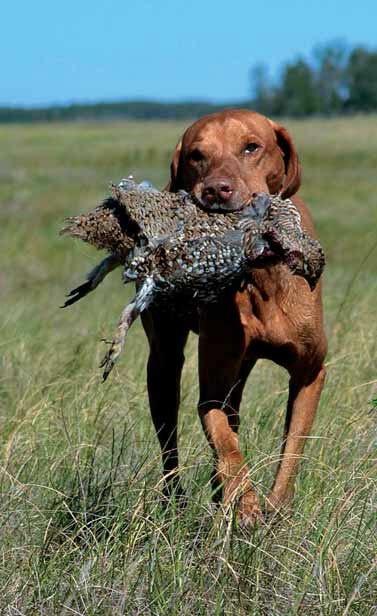 Upland dogs specialize in flushing pheasants, quail, grouse , snipe, pigeons and doves from grasses and brush in fields and meadows . H.K. only occasionally hunts with Crusoe. “If he’s Crusoe, you’re Friday,” I say. H.K. gave me a copy of Gun Dog after meeting Gage. Author Robert A. Wolters was best known for applying the discoveries of animal scientists to hunting-dog training. H.K. was trying to tell me something with the gift. Its not the car. Its the driver. Aside from being a sportsman and a writer, Mr. Wolters was a chemical engineer and taught art history and photography. He was a picture editor at Sports Illustrated. I am surprised he was never president of the United States. I wish he were running for office today, butWolters suffered a fatal heart attack in 1993 after piloting a glider near his farm in Hanover, Virginia. He was 73. I need to read his book. Recently I saw Crusoe in action; I joined man and beast to hunt on a farm in Keswick. I left my dog at home. ” Wasn’ t Velcro invented in this area?” asks H.K., as we cross a field. the ground, does what he was genetically engineered to do. I explain a DuPont scientist in Waynesboro invented spandex in 1959. “It should be worn sparingly,” I say, as Crusoe alerts to something in the heather. We walk with guns up and I disclose what I know about Velcro; a Swiss engineer invented it in the 1940s. The idea of the hook-and-loop fastener came from doing what we were doing: walking in a field with a dog. The inventor noticed cockleburs stuck to his pants and to his dog’s coat. The rest is history. I notice cockleburs on my military fatigues; Velcro straps enclose the sleeve system of my Gore-Tex jacket. To pay homage, I pull a strap and produce that ripping sound only Velcro can make. “You’re a wealth of useless information,” says H.K . Strickland sees things similarly to Youmans here in Virginia. For instance, out-of-state college students often recognized the breed when locals did not. 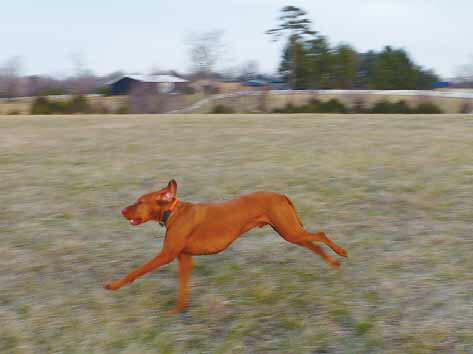 Longtime, well­ traveled quail hunters were skeptical when the red dogs came out of the kennels to hunt Blandfield Plantation, near Tappahannock , where Strickland guided for eight years. If our lives depended on a kill we would have starved. At one point, Crusoe flushed a pheasant; my friend fired into the setting sun. We walked back to his Range Rover parked on top of a ridge. The only shots I fired came from my Leica. One image stands out in my mind . I took the shot during quitting time, before we reached the vehi cle. 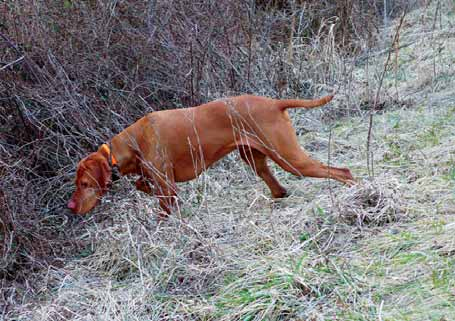 In the picture, H.K., over/under shotgun folded over shoulder, watches Crusoe point at something in the thicket. I put the camera down as the hunter followed his gun dog. I remain uncertain as to which creature more closely resembles Velcro.